VA Form 10-2850d or the "Application For Health Professions Trainees" is a form issued by the United States Department of Veterans Affairs. 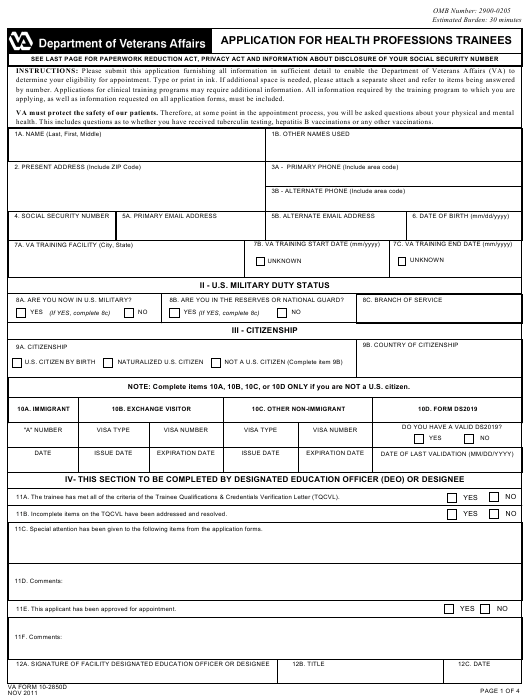 The form was last revised on November 1, 2011 - an up-to-date fillable PDF VA Form 10-2850d down below or find it on the Veterans Affairs Forms website. applying, as well as information requested on all application forms, must be included. health. This includes questions as to whether you have received tuberculin testing, hepatitis B vaccinations or any other vaccinations. 8A. ARE YOU NOW IN U.S. MILITARY? 8B. ARE YOU IN THE RESERVES OR NATIONAL GUARD? NOTE: Complete items 10A, 10B, 10C, or 10D ONLY if you are NOT a U.S. citizen. DO YOU HAVE A VALID DS2019? 11A. The trainee has met all of the criteria of the Trainee Qualifications & Credentials Verification Letter (TQCVL). 11B. Incomplete items on the TQCVL have been addressed and resolved. 11C. Special attention has been given to the following items from the application forms. 11E. This applicant has been approved for appointment. The following two questions apply to both your current health profession and any prior health profession. OR HAVE YOU EVER VOLUNTARILY RELINQUISHED A LICENSE, CERTIFICATION, OR REGISTRATION IN LIEU OF FORMAL ACTION? VOLUNTARILY RELINQUISHED CLINICAL PRIVILEGES IN LIEU OF FORMAL ACTION? WOULD BE IN VIOLATION OF THE CRIMINAL FALSE CLAIMS ACT? action or proceedings, date filed, court or reviewing agency, and the status or outcome of the case concerning those allegations. Please also provide your explanation of what occurred. ALL OF MY STATEMENTS ARE TRUE, CORRECT, COMPLETE, AND MADE IN GOOD FAITH. after you begin work. Also, you may be punished by fine or imprisonment (U.S. Code, Title 18, Section 1001). Authorize VA to share any information about me with the affiliated institution or training program official. Washington, DC 20420. Do not send applications to this address. administration processes carried out in accordance with established regulations and systems of records. large number of Federal employees and applicants with identical names and birth dates whose identities can only be distinguished by the SSN.